Uhen (1998) didn’t resolve the positions of Ambulocetidae and Remingtonocetidae, however since they were recognized as separate groups in the discussion, I showed them as such. 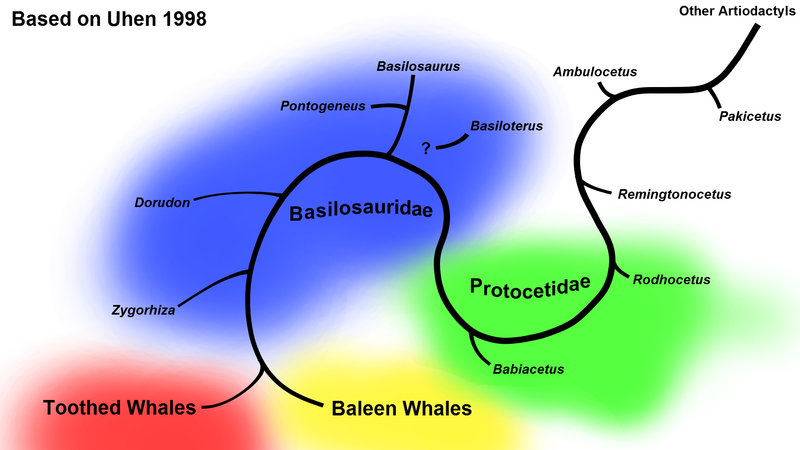 Basiloterus was not subjected to phylogenetic analysis, but considered a member of Basilosauridae, hence the uncertain placement. Since Uhen (1998), the clade ‘Pelagiceti’ was recognized and includes all basilosaurids, toothed and baleen whales; ‘Neoceti’ includes only the toothed and baleen whales and their mysterious relatives. Kekenodon is not a new species, but was for a time considered a baleen whale. Ocucajea is new and while classified as a basilosaurid, seems to be a closer relative of modern whales. The rest of Basilosauridae has been substantially re-structured: perhaps most notably, Dorudon and Basilosaurus are sister taxa. This phylogeny didn’t include remingtoncetids or ambulocetids, they were added since I wanted this to be an animation (turns out it doesn’t work so well with the airbrush, huh). Basiloterus was not analyzed and its position is unknown (but it seems to be a basal basilosaurid). Okay, those are definitely paragraphs, but at least they’re small enough to be optional. So what is… The Third King? Some of its remains were previously known as Eocetus or “Eocetus” (long story) and they were classified as protocetids less derived than Babiacetus. 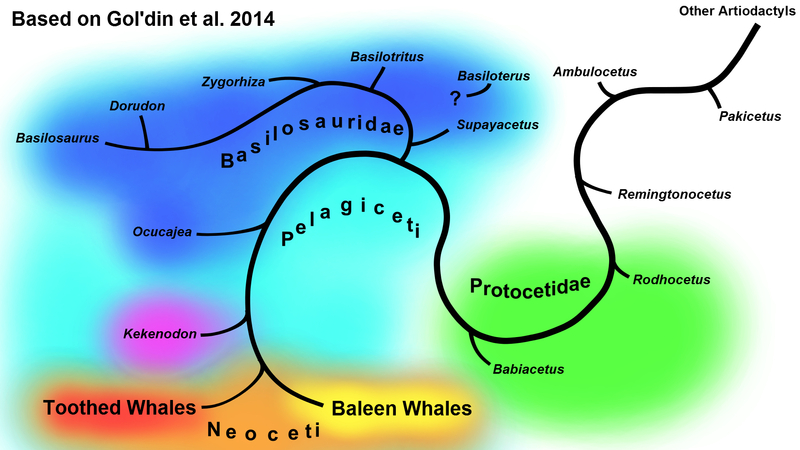 In 2013, Gol’din & Zvonok argued the association with Eocetus was a mistake and moved the whales into Basilosauridae under the new name Basilotritus. That group now contains three lineages characterized by elongate vertebrae and large body size: Basilosaurus (“lizard king”), Basiloterus (“another king”) and now Basilotritus (“the third king”). I really hope this tradition continues¹. In addition to the large size and elongate vertebra, Basilotritus has two rather unusual diagnostic traits: vertebrae with a pock-marked texture and layered bony tissue on the neural spines (Gol’din & Zvonok 2013). The pock marks are the openings of vascular channels and are hypothesized to be related to the long-term growth of considerable bony tissue; the layers of bone are also apparently a result of this (Gol’din & Zvonok 2013). Basilotritus then has a condition known as pachyostosis, which could allow it to be a good, long-distance swimmer at the expensive of speed and maneuverability (Gol’din & Zvonok 2013). Pachyostosis is present in other basilosaurids, but apparently does not involve the vertebrae (Gol’din & Zvonok 2013). There seems to have been something very strange happening with the growth and maturation of Basilotritus. The Basilotritus sp. pictured above has 5 growth layer groups — likely indicating an age of 5 years — and yet has unfused epiphyses on its cervical vertebrae, something that normally happens very early in the life of a whale (Gol’din et al. 2014). Gol’din et al. (2014) consider this a sign of paedomorphosis (along with the pachyostosis), although they are uncertain if Basilotritus rapidly reached a large size but didn’t reach skeletal maturity until later (like a baleen whale) or if it continued growing for nearly a couple decades (like an Orca). It’s astounding that cetaceans reached huge sizes so early in their history. I suspect that basilosaurids “experimented” with different growth strategies for reaching huge sizes and exploiting new niches. Despite their apparently unusual growth strategy, the Basilotritus species converged on some Neoceti in regards to the number of lumbars (11–13, depending on species) and the elongation occurring in the posterior thoracics and lumbars (Gol’din & Zvonok 2013). In comparison, the huge Cynthiacetus was strange (non-elongate vertebrae, very numerous thoracics) and the leviathanic Basilosaurus was crazy weird (extreme elongation, numerous vertebrae, lumbar-like thoracics and caudals). There’s more to Basilotritus than vertebrae; parts of ribs, innominate bones, sternum, scapula, hyoid, tympanic bulla and skull have been found (Gol’din & Zvonok 2013); but perhaps the most interesting are the teeth. This Basilotritus sp. from Ukraine has severely worn teeth, and in one molar the entire crown is almost worn off (Gol’din et al. 2014). This is the same individual as the previous picture, so it managed to do this in only 5 years, some of which it presumably spent nursing. A similar amount of wear occurs in Orcas that prey heavily on sharks, and it likely wasn’t a coincidence that this specimen of Basilotritus sp. was found with numerous shark teeth (Gol’din et al. 2014). Of course, it probably shouldn’t be assumed that all Basilotritus fed heavily on sharks, and perhaps like Orcas it was only practiced by one small sub-population for a small period of time. So… fossil whales never cease to amaze. I can’t wait until this post is laughably outdated in a couple of years. 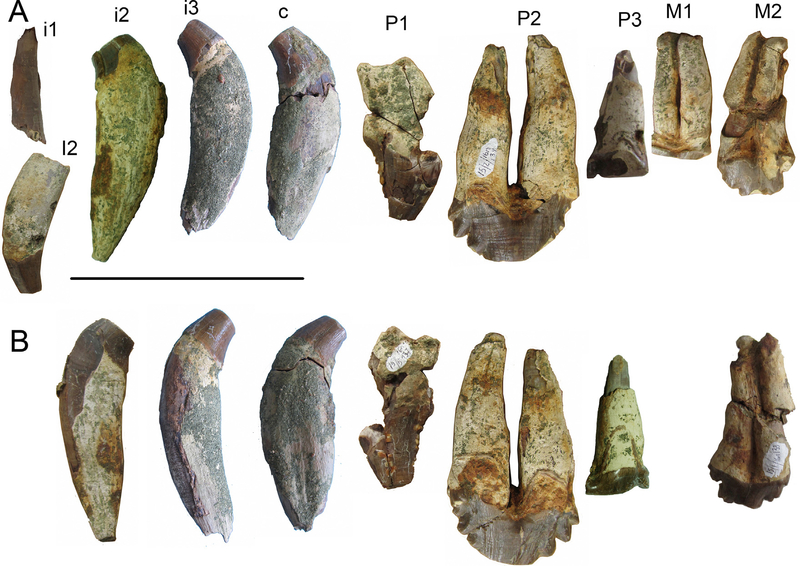 Gol’din, P. & Zvonok, E. (2013) Basilotritus uheni, a New Cetacean (Cetacea, Basilosauridae) from the Late Middle Eocene of Eastern Europe. 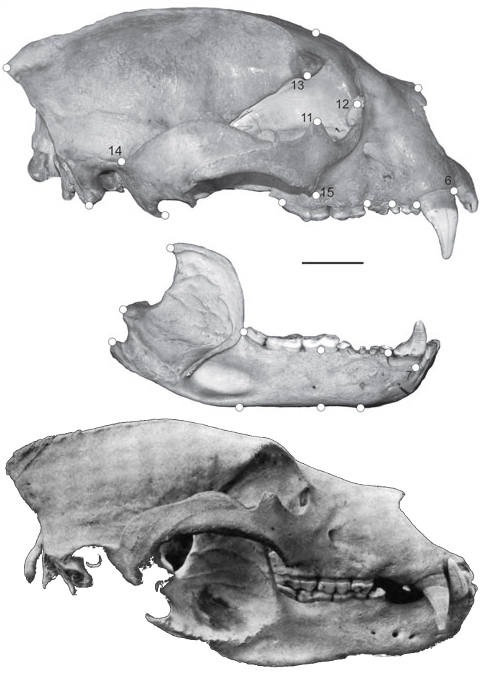 Journal of Paleontology 87(2) 254–268. ¹ Basilosaurus drazindai is presently known from only one vertebrae with several significant differences from other Basilosaurus species as well as Basilotritus (Gol’din et al. 2013). Considering its age and the apparent close relationship between Basilosaurus and Dorudon, I think it’s very likely to be something… else. Other big, elongate vertebrae have been named “Platyosphys paulsonii“, “Platyosphys einori” and “Platyosphys sp.”, however they’re all lost or in poor condition and now considered nomen dubium (Gol’din et al. 2013). They could be members of the other Basil– lineages.